What mode of transportation is the best choice for the movement of your freight? Each mode offers its own set of pros and cons and is best suited for different situations. One of the most common debates is over-the-road (truckload) vs. intermodal (rail). Many shippers stick to using trucks/vans to move their product because it’s what they are familiar with, and it works. But there is potential to switch traditional over the road (OTR) shipments to rail, with possible savings of a few hundred dollars per load. 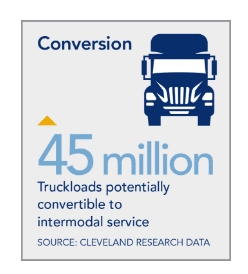 Cleveland Research reports there are 45 million truckload shipments that could be converted to intermodal service. So, let’s look at scenarios where you might be able to make the switch and positively impact your freight spend. Almost anything can be transported by rail, including cold and frozen goods. Cold chain shippers who are looking to satisfy the intensive requirements of perishable goods with the goal to cut resource consumption have found that rail transportation can do both. OTR transportation includes full truckload, less-than truckload, and van transportation. Trucks can also move a wide range of products – arguably more so than rail. America’s freight railroads have made major investments – more than $635 billion since 1980 – leading to massive expansion and tangible benefits for shippers. Through maintenance, upgrades, and new technology, the rail network is projected for continual expansion through 2020, at least. In the past, delivery variance and adherence to projected timelines has been a concern for rail customers. Today, intermodal lane transit times continue to improve with infrastructure development. Today transit times are far more reliable, consistent and competitive than they were in the past. Since trains run on a set schedule and with fixed routes, there is less variability in pick-up and delivery times as compared to truckload. Rail is also not as easily influenced by weather conditions and can typically keep moving through heavy rain, fog, and snow. Containers moving on solid blocks of flatcars rarely sustain damage, especially if the freight is blocked and braced correctly. Technology and big data investments are also helping to lower incident rates. While there is added vibration with rail, there is less handling when compared to LTL transit, and the risks associated with weather and road construction are all reduced. Railyards are also constantly monitored and no one can go in or out without documentation. Cars can be locked, have monitoring technology, and require a pick-up number for access. This makes rail a great option for high-value freight such as beauty or food products. An intermodal transportation strategy can help reduce cost variances. 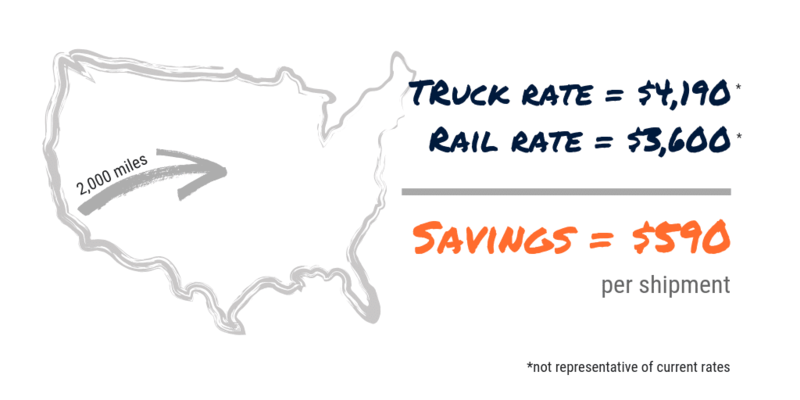 Unlike trucking, capacity and pricing stay relatively flat with rail. Capacity constraints for truckload can mean 35-40% price variation during peak seasons, but with rail, the variance is only 10-15%. Using intermodal transportation can save money, especially for long-haul loads. One ton of freight can be transported 400 miles on one gallon of fuel; far more miles than trucks, which translates to lower rates for shippers. The below image is representative of savings for a frozen load traveling 2,000 miles between Southern California and the Midwest. Moving freight by rail instead of trucks gets vehicles off the road and reduces greenhouse gas emissions by 75 percent, according to the AAR. Additionally, railroads move one ton of freight an average of 470 miles on a single gallon of gasoline. Shippers who are concerned with the environmental impact of their supply chain are attracted to intermodal as well. It produces significantly less carbon dioxide per 100 ton-miles than trucking. In fact, trains are more than ten times energy-efficient as trucks per ton/mile. Leveraging intermodal transportation means you can use double-stacked containers, bringing maximum efficiency to high-volume shipments. Additionally, it takes less labor to operate a train than the equivalent number of trucks needed to haul the same freight. The typical intermodal transit is truck transit, plus a day. 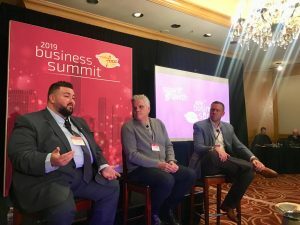 Shippers who can plan ahead and accommodate for the extra day have no issues with this extended timeline, but with increasing use of the “just-in-time” retail and production strategies, an added day can mean a missed sale. Every rail shipment requires additional drayage service. Local drayage providers must pick up rail cars when they arrive and bring them to their final destinations. It can be difficult coordinating proper pickup times, avoiding storage and detention charges. Working with a 3PL that has drayage relationships helps. Geographical reach is improving, and railroads are continuing to invest in the building of infrastructure that allows for easier access to port locations and inland intermodal sites. Yet, America’s Class I freight railroads operate in just 44 states across the country. Generally, pick-up and destination locations should be within 50 miles of their respective intermodal ramps. So, intermodal is not accessible to all shippers. The total weight allowed to be hauled on the road is the same for truckload and intermodal. Unfortunately, an intermodal container can carry less than a typical over-the-road trailer because of the added chassis weight. Most rail provides will move up to 43,500 lbs. per container, some only 42,500 lbs. The biggest advantage of truck transport is the flexibility provided. This difference often trumps all other benefits because a shipper needs to act quickly. Not tied to railroad schedules, a dedicated truckload carrier can move the product anytime, anywhere. Over-the-road transportation can handle any volume. While rail is a secure mode, many shippers feel more comfortable moving high-value product via truck. It is reassuring to know that a driver will be in constant contact with freight and can more closely monitor goods. Just like rail, truck trailers are locked at all times and can use security seals to indicate if a load has been tampered with. Technology advancements are helping to curb the issue for all modes. 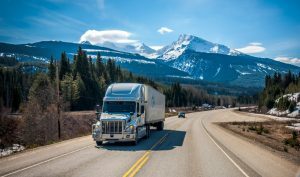 The 2018 trucking market is tight, with a looming driver shortage and influx of demand for shipping services. Finding a qualified and reliable truck willing to move your product is easier said than done. The United States grows by roughly 2,300,000 people a year with an annual population growth rate of 0.71%. Roads are increasingly congested, leading to delays and vehicle accidents. Deliveries into major metro areas now charge added fees to make up for the loss in driver productivity. Committee for Economic Development reports that America’s roads and bridges cause issues that range from the small daily inconveniences of longer commutes to safety concerns and economic burdens. The country’s backlog of needed highway and transit infrastructure projects has reached $926 billion and will need billions more over the next two decades to keep up with demand. Unless the infrastructure deficit is addressed, OTR transportation will face monumental safety and efficiency issues. With an increase in demand for transportation services, this is one of the largest issues faced by truckers. OTR freight tends to be more high-touch than rail, particularly LTL, with loading and unloading occurring at multiple locations. This equates to more opportunities for damage. The transportation industry accounts for one-third of carbon emissions and 28 billion gallons of diesel fuel per year. Scientists and engineers are working tirelessly to identify new energy sources to help cut emissions, and there are already electric semis in the market. Telsa’s truck, being released in 2019, has a price tag that’s estimated to be over $200,000, far above the average $120,000 price tag of a diesel Class 8 vehicle. Large companies like J.B. Hunt, Walmart, Anheuser-Busch, Meijer, and UPS have already preordered. Yet 90% of the trucking market is comprised of mom-and-pop operators with six or fewer trucks under management. For them, electric semis are still out of reach. The idea of using intermodal can be intimidating for anyone not familiar with how it works. But, done right, it’s a direct way to reduce logistics costs while maintaining reliable service. Does rail sound appealing now that you’ve learned about the pros and cons? Start by finding a trusted partner that can help evaluate whether you can successfully integrate rail transportation into your logistics network. If interested in exploring how intermodal can reduce your shipping costs and improve the consistency of your service, reach out to Zipline Logistics today.